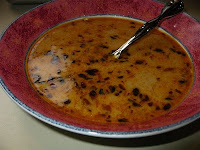 My mom made this soup the other day, and we liked it so much we took a picture of it. I took the day off of work today, sort of a "personal regeneration" kind of day, and I'm spending it making a double batch of this soup to put up. Variations from the recipe: using chicken broth instead of beef broth, and not putting in the cream (see "Dairy is Taboo") - we can add the cream when we heat up the soup. 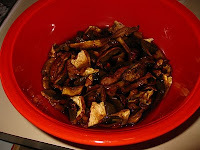 Soaking the mushrooms - because I had to take a child to day care, they soaked longer than 30 minutes. Not a problem. 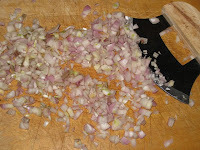 Chopping the shallots and garlic gave me an excuse to use the ulu. Why I need an excuse to use the ulu, I do not know. Straining the mushroom liquid took a long time. That was unexpected. 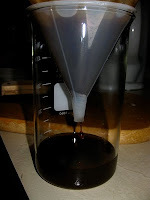 I finally had to force the liquid through the filter because I was getting impatient. Everything simmered on the stove, as I do not have a slow cooker large enough for a double batch of anything. I think, by the time everything got going, it simmered for 2 hours. I decided not to let the mushrooms get really tender because I was just going to can the soup anyway, so the time in the pressure canner would likely make the mushrooms softer. I ended up with 12 pints and a little bit for lunch. I'll be giving some of this away shortly (see "Helping Hand"). Today's recipe utilizes leftovers from last night's dinner at the Hilltop Steak House. When I was little, we would drive up to Saugus, MA, from RI, go to the butcher shop and fill up a few ice chests full of meat, then eat dinner and go home. I don't remember what I used to order, but I do remember drinking Shirley Temples every single time. Then we'd drive all the way home and form an assembly line of sorts to package the meat in freezer paper, label it, and put it in the big freezer. This event occurred a couple of times a year and I always looked forward to it. Ah, childhood. Now we live closer, but it still takes us at least 40 minutes to get there....so it's not often we get there for dinner. However, eating the salad with the house dressing makes me feel like a little kid again. After dinner, I added 1/2 c. of red wine to the rest (seemed like the right thing to do) and I am not(!) canning it - 10 c. of soup into the fridge this time. Another reason why this hobby is great is that I can prepare food for people and it won't go bad sitting on the shelf. In other words, when someone is under the weather and people are showing up with food, mine won't take up precious fridge and freezer space. Such is the situation now, so I made a double batch of khoresh and put up 2 quarts which were delivered yesterday. I'm glad to be able to help. We had company last night for dinner (which is why I made a double batch) and, as a side dish, I put out a pickle tray: toorshi, dilled carrots (spicy! ), bread & butter pickles (the ones with the rice vinegar), and pickled fiddleheads. I also set out a bowl of the 3-bean salad with the beets. When I'd made that particular recipe with golden beets, the color leeched out of the beets. I thought the red beets wouldn't do that, but they did. Strange to see white beets and know that they used to be red! But it was a perfect accompaniment to the khoresh and rice. Kind of like having a chutney. Which I didn't remember I had, or I would have served that, too! Aren't they beautiful? 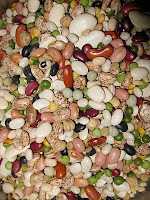 I couldn't resist modifying a ham and navy bean soup recipe by using this package of "16 Bean mix" instead. Don't ask me what all the beans are. I just know they're pretty. Although, I must admit they aren't as colorful once they're cooked. 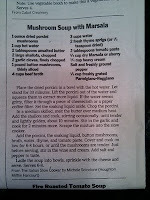 I made a double batch of this (recipe on page 216 of 1001 Delicious Soups & Stews), which is a lot. 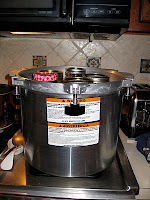 Fortunately, I had enough pint jars (1 0) that I could get all the soup canned, and I am trying the double-decker approach to the pressure canner for the first time. I'm nervous, but I hope it will be alright. It seems very FULL. (Later) They are all fine - and now I can go to sleep! We're having a slow, low-key kind of day. We stayed up until well after midnight, woke up late, and had pancakes for breakfast. After the breakfast clean-up, I got to work on another soup project I'd been meaning to do - beef and barley soup. It's actually just beef marrow, since there wasn't any leftover meat to put in. I'd made a beef stew about a week ago with shin bones, tomato sauce (the last jar of the plain sauce), carrots, celery and onion. We saved the liquid, bones and veggies with the intention of turning it all into soup. This simmered for about 2 hours. The 8 year old devoured a bowl of it for lunch, then I put up 6 pints and we had the rest for our lunch (at 1:30 in the afternoon. It's a slow day, as I said.). Unfortunately, I wasn't paying attention to the canner so the pressure dropped. Since I have no idea for how long the pressure was down, I brought it back up to 10 lbs. and reset the timer for the whole 75 minutes. I'm sure it will be fine.